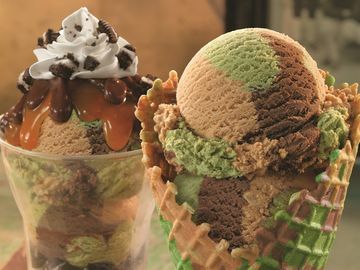 A combination of extra-rich, creamy chocolate ice cream with a sweet caramel ribbon and crunchy bites of HEATH™ bar and pecans, “Bunches of Crunches” will be Baskin-Robbins June 2011 Flavor of the Month and available in stores nationwide. To commemorate her win, Diane visited Baskin-Robbins’ corporate headquarters in Canton, MA on January 24 where she mixed “Bunches of Crunches” for the first time with the company’s culinary team. In October 2010, more than 40,000 ice cream fans played mix-master and created their own ice cream with the Baskin-Robbins virtual Flavor Creator, choosing from 31 base flavors, a variety of ribbons such as fudge and peanut butter and oodles of different mix-ins ranging from candies to cookies. A team of experts from Baskin-Robbins selected 10 finalists and then opened the voting to the public who chose the winning flavor. In addition to having her flavor “Bunches of Crunches” as the June 2011 Flavor of the Month, Diane’s flavor will be immortalized in the Baskin-Robbins ice cream library alongside world famous flavors like World Class Chocolate, Jamoca Almond Fudge and Gold Medal Ribbon. For more information and official rules, please visit www.BaskinRobbins.com/flavorcreatorrules.